I'm having a couple of months where I am knitting heaps but not seeming to finish anything. This seems counter intuitive. I know I am knitting productively but all the completed stitches do not seem to be adding up to finished. Are they disappearing into the knitting equivalent of a black hole or something? Are they going to the parallel universe where all lost socks end up? So I seriously asked myself why the phenomenon was occurring and decided it was because I was simultaneously knitting at least 6 largish things at once and there is one at least one other half finished project from the Ravellenics still sitting out in plain sight that has had any knitting love in a few months. So let's look at them all and chart their progress. (I know it'll make me feel better)! Anyone got Cable! The mighty strip afghan. I have religiously managed a strip a month till June and then I stalled. I actually started two in April. One went on to become the finished April strip and one ended up being frogged. It wasn't its fault. It was perfect. Let's put it down to silly knitter error. I had two random balls of cream Panda Machinewash I bought for like a dollar each on sale at the end of last winter. If I had of thought about it, I would have realised that that amount of yarn wasn't enough to knit a metre and a half of complicated lace cable pattern. But I didn't think and I started and I got the end of the second ball of yarn and it wasn't long enough. Never mind, I thought, I'll buy some more yarn. The store didn't have anymore in stock so I ordered some in. It arrived and damn dyelots, it didn't match. I tried to make it match. I knitted another pattern repeat in the new yarn and then the OCD knitter in me couldn't stand it and I frogged it. (And I mourned its death). 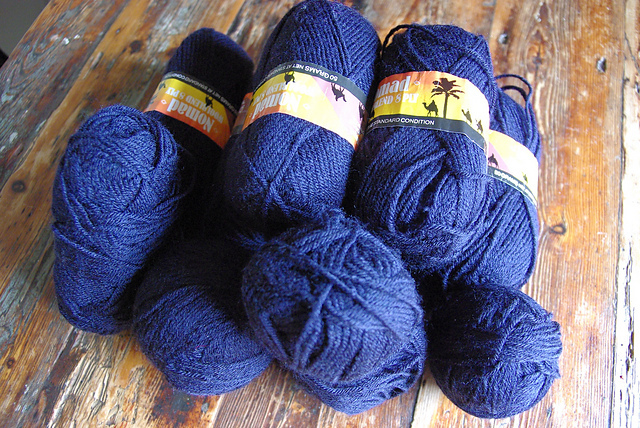 I did go and buy some more yarn though. So I have enough yarn now (and it all matches). I'm going to do the same pattern. But I haven't started it again yet for three reasons - impatient children who want the things I am making for them (see below) finished like yesterday; I still have my angry on with having to frog a beautiful piece of knitting and I don't think I have any good 4mm needles that aren't in active knitting rotation at the moment. Brown as: My first ever knitted shawl. For the 2014 Ravellenics I boarded the Tardis with needles and yarn in hand and joined the giant crew of knitters and crocheters flying through time and space watching the Sochi Winter Games and crafting all sorts of goodness. Some very wonderful fellow travelers offered prizes for our efforts and the Tardis random number generator chose me to get this free pattern. I’ve been contemplating making a shawl for a long time but there were too many wonderful patterns to pick from to make my first. This sealed the deal. I had a pattern so I didn’t have to pick one. I have some very old gifted brown yarn from my Aunty that is perfect for this. I cast on on the 8th of April and it has been flowing along quite nicely ever since. I completed up to the end of third section of the shawl still working this on straight needles as the yarn is so fine it still fits on a long straight needle. This is essentially geometrically arranged panels of faggotted lace. Every second row is just purl with a narrow garter stitch edge. I've just transferred to a long circular needle and completed the transition row for the 4th and last section (And then the nagging from the children intervened again and this is in stand by mode at the moment). Needles: 4mm. I started with 4mm straights till the end of the third section and then moved onto a 100 cm circular 4 mm needle. I do make the occasional mistake and have to tink back a few rows till I have the correct set up again. I had to redo the last four rows of section II 4 times to get it right (Took me two days for 4 rows). The pattern is nicely written and quite intuitive but needs patience and I tend to make mistakes when knitting at night. Knitting a lace shawl is teaching me patience and not to drop stitches! 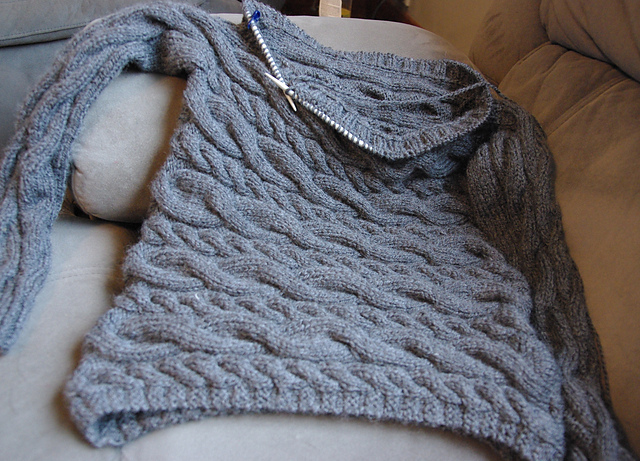 Funky Chunky: A sideways cable jumper for Mel. My kids finally respect my knitting skills enough to ask me to knit them garments. I keep an eye out for things I think they will like. So when I spotted this in an email from Lion Brand, I immediately thought of Mel. We went and chose yarn together and this hit the needles on March 30th 2014. The yarn we picked is light and a 65% acrylic, 35% wool blend in a gorgeous heathered dark gray. Needles: 5.5 mm straights and 80 cm circular needle. This is definitely home on the couch knitting. 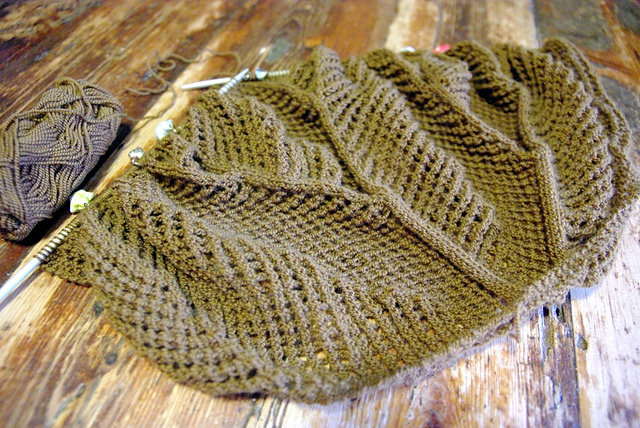 It is knitted sideways in one piece beginning from one sleeve, casting on for the body section, knitting the two sides separately are then rejoining to cast off for the other sleeve. Finally you pick and knit the collar in the round for the neck section. It's definitely a lap full despite the fact that the actual knitting is fairly quick with chunky yarn on largish needles. It also requires intense counting with three different cable patterns running simultaneously with different length repeats. Mel has requested that this be made without bobbles! So I have eliminated all bobbles and am just knitting the cables. The main part of the jumper is completed and seamed and I have picked up the stitches for the neck and knitted about 8 rows. Close to finished. This is probably good as Mel is currently gauging my level of love for her / status as a good mother by my visible progress on this. If she sees me knitting on another garment she plaintively exclaims - "You don't love me anymore, you're not knitting my jumper!" and "You're a bad mother!" Not so Little Boy Blue: I haven't knitted my boy a jumper since he was in nappies. It was time to do it again. Unfortunately he is now grown adult size. Whilst he was home over Easter we chose a pattern and yarn. 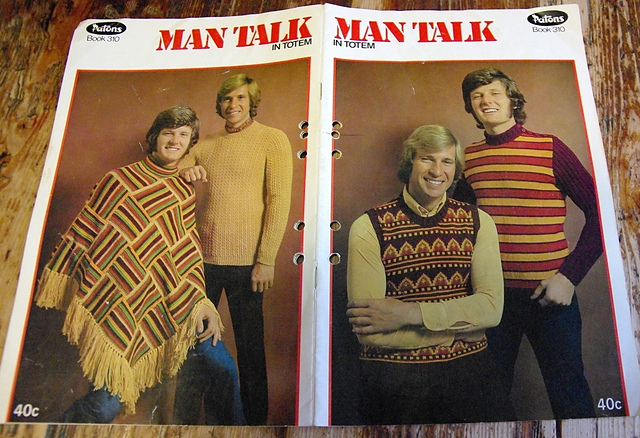 We're going vintage all the way; yarn from the 1980s and a pattern from the delightful pattern book pictured below - Man Talk c1970s. Despite the lurid cover (that poncho anyone?) there are a number of nice classic textured jumpers in this book. The naming is unimaginative though - I'm making jumper no. 3. 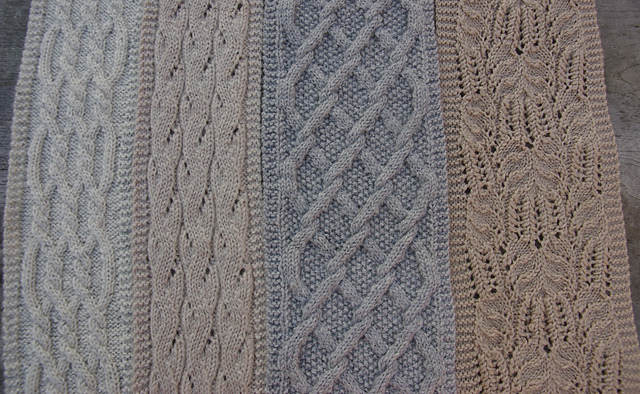 Pattern: From Man Talk Patons Book 310- jumper no 3. I started with a sleeve - mainly because I needed some train knitting and everything else I was knitting was too big to transport or needed too many different colours of yarn. There is an art to good train knitting. It needs to be small enough to fit in a handbag, be simple enough to not to have to refer to the pattern every five minutes and needs to not be too many fiddly small bits. The pattern on this is subtle. It's a variation on a checkerboard type rib - simple but effective. I'm one and a half sleeves in so far. And these sleeves have done about three train journeys, a conference trip to the big smoke and watched my eldest daughter compete in cheerleading. This is a fun knit. 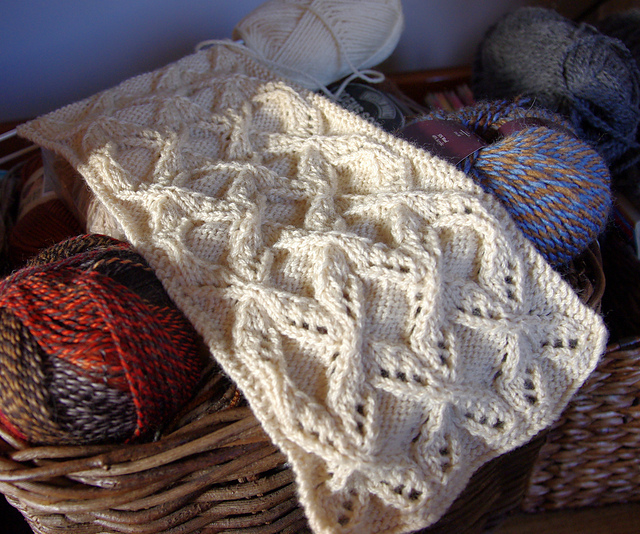 Lacewing: A freefom lace CAL / KAL. I got enticed down the rabbit hole. Roseknits24-7 from VHOC (Village Hopelessly Over-committed) invited me to play in the International Free Form Forum on Ravelry who are hosting a freeform lace shawl CAL/KAL for June/July 2014 based on the Wingspan shawl as a jumping off point. Wingspan has long been on my to-do list and I also love Dreambird. I could so see a lace Dreambird with a faggoted / trellis framework and delicate lace feathers. 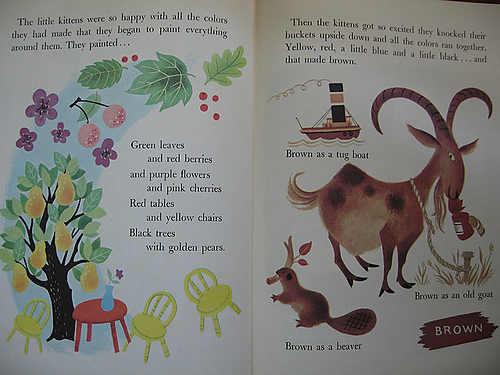 And that was my inspiration for beginning to design this. Freeform is no rules / no limits / no real pattern / design as you go / do what you feel type knitting / crochet. I’m drawn to the colours of a bird’s wing - I’m thinking of the little blue/fairy wrens that are so common in Australia. Complex shades of brown and a flash of brilliant almost metallic blue. I found some pictures of dreambirds that people had made for inspiration. I began with a feather. I hunted through all the free lace shawl patterns I could find on Ravelry. 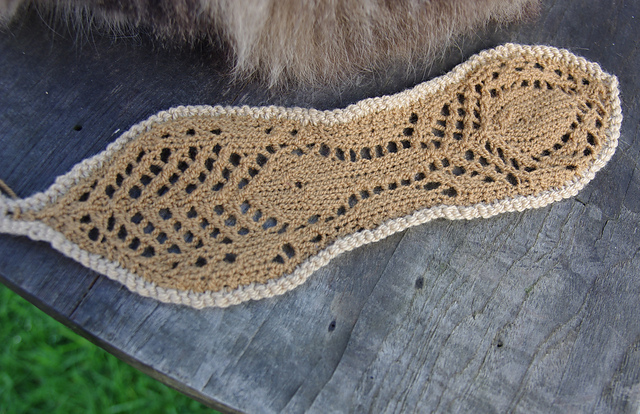 The first feather is knitted in lace-weight antique pure wool from the stash in a olive green poo coloured brown using Gamayun bird shawl lace charts as the starting point. 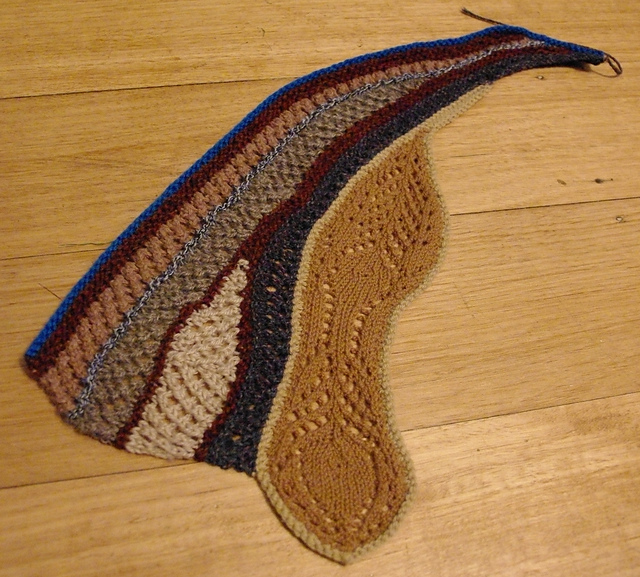 I blocked the feather and knitted on a row around it and cast off. 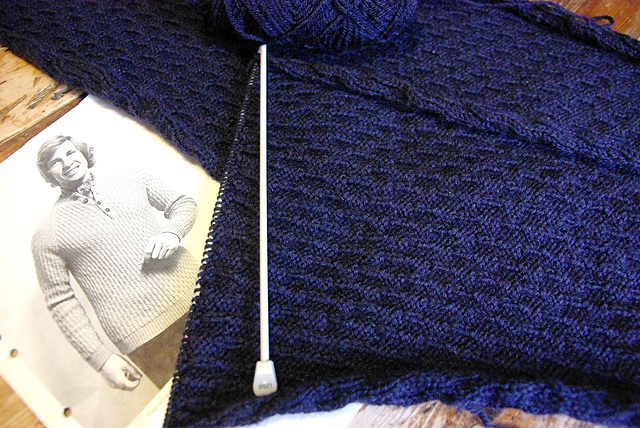 Then I tried some swing knitting / short rows using a couple of simple lace patterns for the rib section. I’m using garter stitch ridges to introduce a ribbed / bone texture in the joining sections. Knitted off both sides of the feather section, sandwiching pockets of simple mesh lace between garter stitch sections. Yarn weights ranges from 5 ply to a thick thin worsted weight novelty yarn. Completed and blocked 15th June. Blocking makes all the difference - opening up the lace and encouraging sections to curve subtly so the piece lies flat. 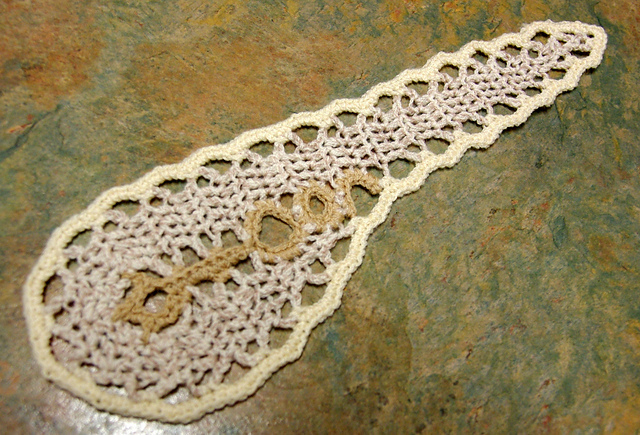 Next I made a feather by improvising a paisley shape using crochet bruges lace as the focal basis of the next section. 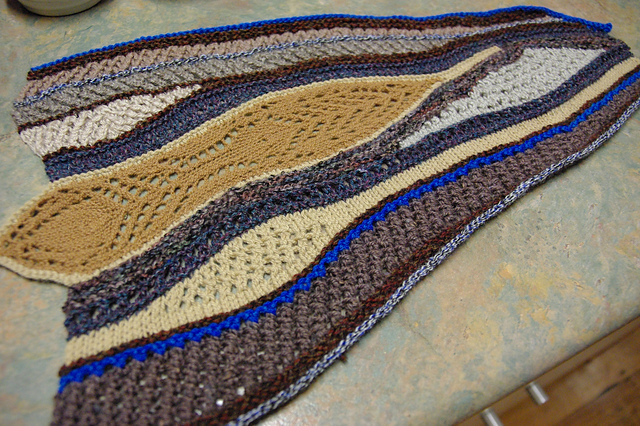 The way this CAL / KAL is progressing is through suggested stitches both knit and/or crochet for each section. I have a whole toolbox of toys to play with now but this is weekend knitting. I have a few other bits and pieces on the go to incorporate into this. 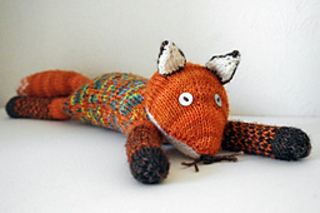 Intrepid Fox: Making baby presents. 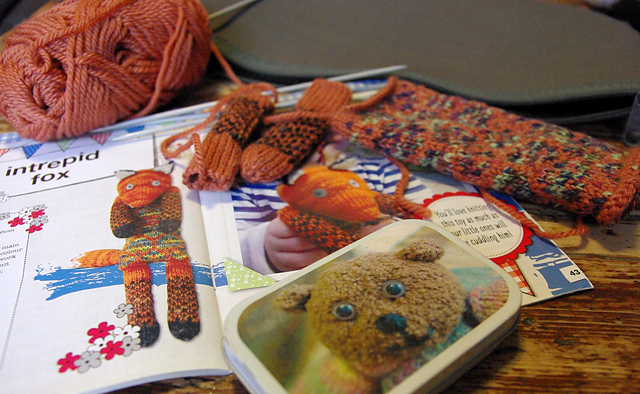 I’ve loved this little guy since I first saw him out in the internet and then in a knitting magazine. He is tiny though - much smaller than I first thought he was but just the right size for small little hands to grip. A large number of the 20 something females of my acquaintance are having babies - my niece, the young lady I drive to Uni.... I'm stocking up on knitted baby gifts. I started this on the 8th of June and this too has been train / travel knitting. So far, I've finished the body (though I'm not really happy with the the level of contrast between the variegated yarn I used for the fairisle and the solid body colour) and nearly two legs. All in all, it's no wonder all that knitting hasn't resulted in any finished objects.